You are visiting Delasol for the first time, being impressed with the luxurious, Mediterranean-style homes blending in harmoniously with the lush, tropical, and immaculately-maintained landscaping. However, something is different. Suddenly, it hits you. Delasol has sidewalks. Sidewalks are an amenity that many Florida communities lack, even those similarly upscale in Naples as Delasol. Delasol is a small community comprised entirely of single-family estate homes. It is located in what the locals call the Livingston Road corridor, west of Interstate 75 and Livingston Road itself. The gated and guarded entrance is directly across the street from the north entrance of Carlton Lakes and just a short distance south of North Naples Middle School and the Royal Palm Academy. Residences take up less than 50% of the Delasol community. 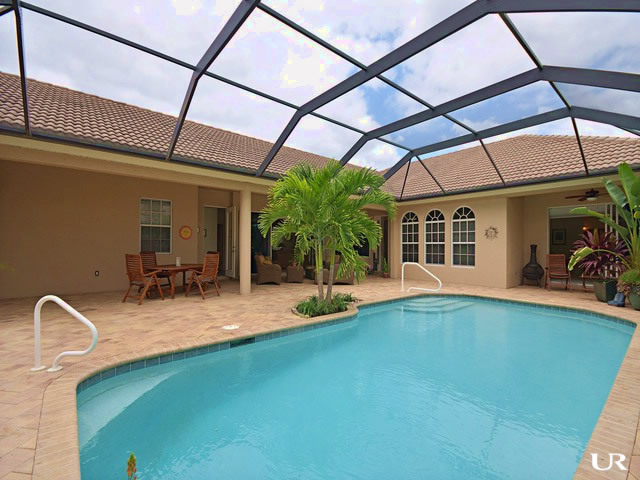 The remainder is all natural Florida landscape that not only preserves the inherent beauty of Southwest Florida and the Naples area, but also buffers the property from the outside world. Delasol Listings - Updated Every 15 Minutes! One of the smaller and most intimate communities of estate homes in Naples, Delasol is completely built out with only 286 homes, many of which overlook one of the several lakes. All Delasol homes have paver driveways and barrel-tile roofs. Fifteen different floor plans, including two-story and courtyard-style designs, are available in two distinctive collections, the Madera and the Viento. The Madera Collection includes homes that range from 1,800 to 2,453 square feet. Madera homes have either two or three bedrooms, plus two baths. All have either multiple living or dining areas – or both. Homes in the Viento Collection start at 2,377 square feet and continue up to more than 3,800 square feet. Viento designs feature two, three, four, or five bedrooms. The majority have three full baths. Some are available with three-car garages. Some floor plans offer as many as three living and two dining areas. The Delasol clubhouse is just a leisurely, two curves past the distinctive guardhouse on Delasol Lane. Clubhouse amenities include the requisite social room, state-of-the-art fitness center, tennis courts, pool, and spa. Nevertheless, a majority of the individual estate homes have their own, private pools. School-age children in grades kindergarten through fifth attend Veterans Memorial Elementary School. Sixth, seventh and eighth graders go to nearby North Naples Middle School. High school students attend Gulf Coast High School. Veterans Memorial is a Professional Development School (PDS) that utilizes the additional resources of a local business partner and Florida Gulf Coast University. The teacher to student ratio is less the 1/20 in all six grades. The school employs a continuous, progressive instructional model. It is located just east of Livingston Road on Veterans Memorial Boulevard less than five minutes from Delasol. North Naples Middle School is proudly training “Today’s Learners” to be “Tomorrow’s Leaders.” The 866 students enjoy a similar teacher to student ratio as the elementary school.Gulf Coast High School is east of the interstate on Immokalee Road. Over 2,100 students are proud to be called Gulf Coast Sharks. U.S. News & World Report honored GCHS in 2015 as a Silver Award Winner in its list of the Best High Schools in America. The teacher/student ratio is slightly more than 1/20. Delasol has rapidly become one of the most desirable communities in Naples. The beaches, schools, entertainment, dining and shopping options are only minutes away. Delasol is a prime location for families to enjoy all that is uniquely Naples, Florida.